Puppy digging can turn your yard into a moonscape. Puppies—and especially terrier breeds—just can’t escape the lure of kicking up dirt. 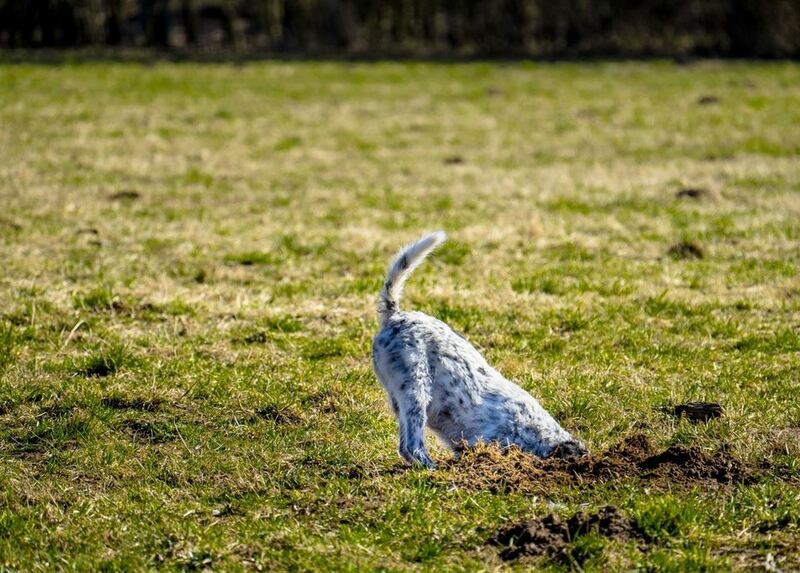 Terriers were bred to “go to ground” after burrowing critters, and they can’t help themselves. If not allowed an outlet, they may dig through your sofa or carpet. But he doesn’t have to be a “holy terrier” to indulge in diggidy-dog behavior. Puppies of any breed may notice you working in the garden and want in on the fun and copy your digging. They dig up plants, tunnel beneath fences, or dig out of boredom. They also dig to cool off or stay warm. Hot dogs instinctively scoop out holes to rest their tummies against the cool soil. In the winter, dirt is great insulation and a hole is a warm place to rest. Understanding why pets dig can help you figure out ways to stem the excavation. Tell Him No. Ideally, you want to interrupt your dog’s digging habit by first telling him to stop. Use an air horn, handclap, or short, emphatic NO! Then praise when he stops digging, and give him a toy or treat to replace the forbidden activity. Give More Attention. Dogs that dig out of boredom need more one-on-one attention from the humans they love. Spend more time with your pup and when he’s in the yard, give him something better to do. Tire Him Out. 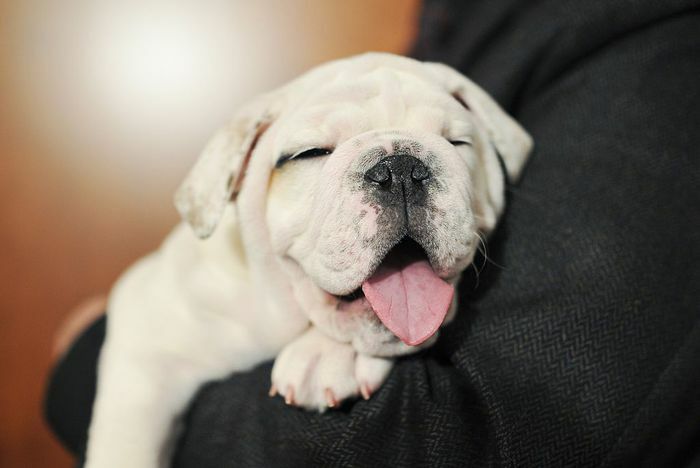 Exercise tires out puppies and reduces digging—a tired pet is generally a much better-behaved pet. Twenty minutes aerobic exercise twice a day is a good rule of “paw” for pups over four months of age. Just make sure both you and your pet don’t over-heat when playing fetch. Cool Off Hot Dogs. In hot weather, give outdoor pups plenty of shaded, cool damp places to rest with lots of available water. That will prevent the urge to tunnel for cool resting spots. Better yet, bring him inside to cool off to prevent heat stroke. Keep Pup-cicles Warm In cold weather, provide a warm place sheltered out of the wind and wet. Refer to these cold weather tips to keep puppies safe and prevent the need to dig. Fix Your Pup. Spayed and neutered dogs have much less incentive to escape a fenced yard in search of company. Provide A Puppy Pastime. Puzzle toys such as the Goody Ship, Buster Cube, or Kong toys can be stuffed with peanut butter and other goodies. Rex will be much more inclined to work at getting the treat out and forgo the pleasure of pockmarking your yard. Make Temptations Unattractive. Placing chicken wire an inch below the topsoil, or scattering cut up rose trimmings, holly or other prickly mulch helps keep puppies from digging in gardens. Sticky Paws for Plants works well to keep indoor plants safe from your puppy’s digging behavior. Barricade Openings. Sometimes it’s helpful to cover over the holes with canvas, chain-link fencing, bricks, or other impediments. But some dogs will not be denied, and simply dig around the obstacle. Give Him His Own Digs. For hard-case puppies, build a sandbox for his legal excavation. A shaded area about three feet wide, six feet long and two feet deep will satisfy most dogs. Let him see you bury one or two of his toys (very shallowly) and then encourage him to dig them up. Get down on your hands and knees and show him by pawing the sand with your hand. Your puppy lives in the moment. She does not hold grudges and she is not out to get you. She is young, full of love and energy, and is looking for something to do. There are lots of toys available that are designed to entertain your puppy. Forget about what the neighbor’s think! If a doggy playpen can save the rest of your yard and preserves the love you have for your puppy, isn’t it worth it?